The CIAJ mailed questionnaires to 1,200 cellular phones users (100 male & 100 female users in each of the following age groups: under 20, twenties, thirties, forties, fifties, sixties) residing in the larger Tokyo and Osaka metropolitan areas from the end of March through April of this year. The results were announced in Japanese Here. 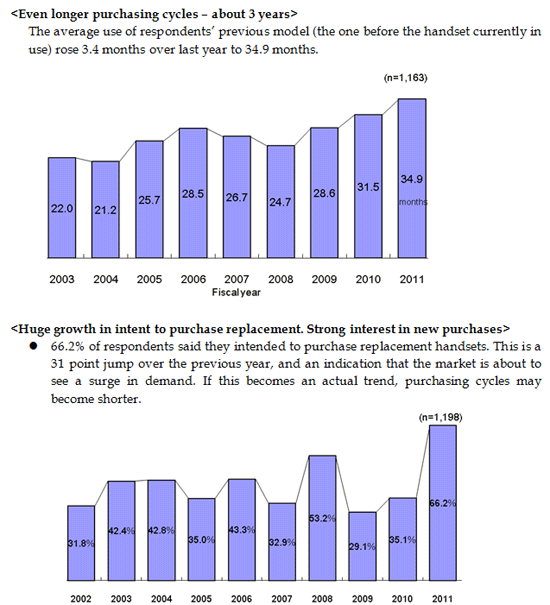 This study has been conducted since 1998 to capture on-going changes in the domestic mobile communications market. 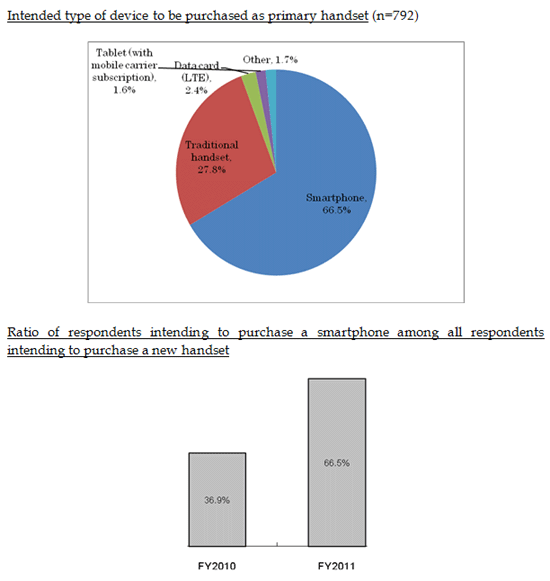 The 2011 survey of cellular phone use has enhanced the coverage of smartphones, identifying intentions to switch to a smartphone and dissatisfaction expressed by purchasers. Interest in purchasing a smartphone is high, and the results indicate that its demand will pump new energy into the market. The unique findings from this year’s study is also available in English now via .PDF Format Here. Congrats to those of you with attention span to make it all the way down to the bottom! So, a bonus prize – thought we point-out the ‘juicy’ something. Take a look at the 2010 Survey.. and compare again to this most recent one.. notice something missing? So did we; what happened to Mobile Wallets? We asked, apparently the 2011 results – showed a mere 8.8% – slipped off the bottom of the chart! 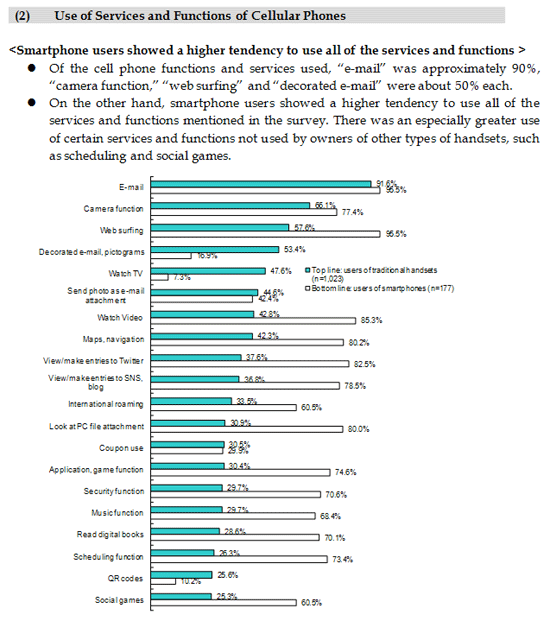 To be fair, again if not clear, the segments noted above are (as always in years past) based on “Daily Usage” and these responses came from across all age group demographics.. hell we don’t even use NFC every single day. That said; Year on Year compared shows the standard Tap & Go behavior appears to be trending off.. while watching Digital TV continues to show strong growth gains. Interesting tid-bit for those paying attention (no pun intended) as we see plenty of digital ink lately on NFC for overseas. Trust those who pick-up on this will remember to credit the source..
previous post: DeNA Release Q1 2011 Results :: next post: TGS 2011 – Ready, Set.. Game!